Rahamim now has a brand new podcast! Tune in to Thresholds on iTunes, Stitcher, Spotify or Tune In. Alternatively you can stream our podcast directly from our website or download it and save it for later. This podcast is also available on iTunes, Stitcher, TuneIn and Spotify. If you like what you hear and are listening to us on iTunes or Spotify, why not follow us or subscribe. You can also leave us a review or give us a rating. This will help other listeners find us online. For a list of resources that relate to this podcast click here. If you would like to purchase a copy of Trevor Parton’s book “Fire, Earth, Air and Water: Poems, Images and Essays by Trevor Parton”, Please email us at educator@rahamim.org.au. If you want to listen to the full interview, unedited, please go to our Thresholds Unedited Page. Sally Neaves of Rahamim Ecology Centre interviews Sr Patricia Powell rsm about her life's work and spiritual journey. She discusses how Indigenous cultures and the Universe Story had a profound impact on her consciousness which set her on a new path. She also talks about the birth of Rahamim and shares her thoughts on where we might be headed. Sr Anne Boyd csb is the founder and coordinator of EarthSong (an Earth literacy organisation) as well as editor of the former EarthSong journal. She is also known for her work as a Brigidine Sister and with EarthSpirit. In this episode Anne discusses her life and inspiration as an Earth literacy educator and how she has worked to shift human consciousness. 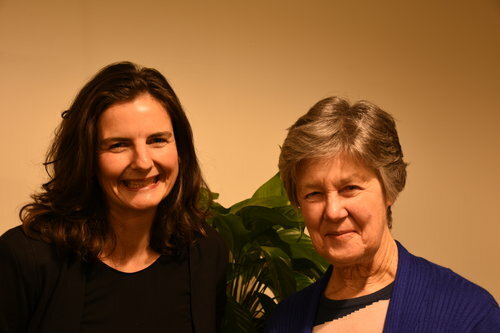 Former Brigandine sister Pat Long shares her story of transformation from a Christian worldview working in social justice to a less anthropocentric way of being and understanding of the world in the new story. This dramatic change occurred as a result of a 12-week sabbatical at Genesis Farm in the US. Pat talks about this experience of letting go of tradition and moving from one way of viewing religion and spirituality to another. This podcast is also available on iTunes, Stitcher, TuneIn and Spotify. If you want to listen to the full interview, unedited, please go to our Thresholds Unedited Page.